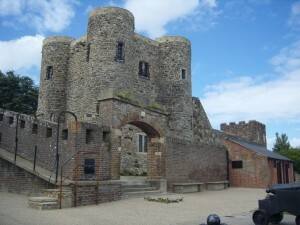 Rye Castle is a small venue which is why there are only a small amount of guests allowed for the ghost hunt, however on this evening a number of guests failed to turn up so the group was smaller than previous ghost hunts. This meant that the ghost hunt was more intimate for those who were present and the personal evidence that these guests encountered was brilliant. We kept all the guests together since the group was about half the size it should have been and held three sessions. The first session was a tech and gadget session in the main Keep where the guests we able to get basic yes and no answers to their questions as well as experiencing strange energy spikes on our meters. The second session was a table tilting session in which we had some movement on the table and the third session was a séance session where we were joined by a male spirit aged in his 50s from the 1890s. He was called Anthony Dwight and he was a well-dressed gentlemen wearing a smart pin striped suit and had a pocket watch. Anthony was able to move the majority of the guests by their arms and pull various people by their arms to the floor, which was all very amusing to us. During the free session (when guests can venture off on their own) guests were coming back to us in the base room after being upstairs in the Keep or in the Woman’s Tower and reporting that something unusual happened to them. On all occasions they had thought there was someone else in the room with them, when in fact they had all been on their own (in pairs). One pair of guests reported that first they thought someone spoke to the them and then they heard the “woosh” of a lady’s dress as it passed them by. All in all, a very interesting ghost hunt and we look forward to our return in September 2016. Group B – We started by using the dowsing rods & pendulums and everyone had movement except the male guest and Ted (curator). There were several female spirits communicating with us, and we could feel the energies walking amongst us. Ted was getting pushed back, sensing the energies didn’t want the men in the room. We tried some table tipping and had continuous gentle rocking, no difference with females only touching. We tried the writing planchette, but the table just kept rocking. Tried some glasswork but only a little movement and again the table still rocked. Switched back to table tipping which moved a lot, but gently. Chloe (guest) started feeling sick, and felt like someone was holding her hips and gently rocking her. She went outside for a short while, and came back when feeling better. She also had an odd sensation of feeling like she had been here before. We were all feeling a lot of energy around us, and were also being rocked with the table. Group A – Started with the rods & pendulums but not much movement, although using my pendulum spirit confirmed he was the male spirit I had encountered before, and he would move the table for us, so we tried table tipping. The table moved immediately however Tania (guest) felt the spirit did not want her on the table, and when she stepped back the table moved a lot more. Again we were sensing when the spirit was behind us, and some of us felt unwelcome prods to our backs and arms. We did also hear one heavy footstep near us, then a loud tap, then also a tap on the door, but when we looked out there was no-one there, and we hadn’t heard anything in the gravel outside. We did some glasswork and got some answers: male spirit, was a jailer here, abused 30 women prisoners here, and other women that he brought here. He was here in the 1200’s. Using the writing planchette he drew the letter B. Asked if this was his first initial he said no, asked if this was the initial of someone here – yes, however no-one had a name starting with B. I asked if he knew someone here from a past life, he said yes, and that person’s name started with B. Not everyone was comfortable knowing who it was so we didn’t ask. We had some more random writing, then finished that session with some table tipping. In the free session we wanted to try an experiment: in the main tower we had some guests on the top level doing writing planchette, and some guests in the basement doing glasswork. Some guests with Steve chose a number/shape for spirit to copy on both experiments, and was very pleased when the glass copied the number correctly. I then joined some guests in the Women’s Tower and we started with table tipping. We had the male spirit again, and were amazed by the amount of energy the spirit had. We felt this by trying to push the table back down but was unable to. The table would spin and walk around the room too. We tried some glasswork and the spirit confirmed he was the jailer. Asked if had done another job, yes he was a fisherman. Neither paid well, but he stole. He was caught and sent to prison. He was murdered in prison. Whilst he was a jailer he confirmed again that he abused the women here, but that he also liked men sexually. Asking the colour of his hair, he had ginger hair and beard. As the spirit seemed very willing to work with us we asked him to rotate the glass fast around the table, and then guests took it in turns whilst not touching the glass asking in their head for spirit to stop the glass and change directions, and to their amazement this happened correctly every time. Guests also took it in turns to think of a shape/letter/number, and spirit would draw this about 50% of the time. A fabulous night at Rye Castle, and we all look forward to returning there in Spring 2016. Each visit to Rye Castle has involved a different experience for us and our guests, tonight was no different. Since there were few guests we didn’t split them up and therefore held three sessions, the first a tech and gadget session in the keep, followed by a table tilting and glass movement session and finally a séance session back in the keep. The first session saw the guests get lots of communication on our various gadgets plus there we lots of unusual smells smelt by the guests at different times. The table tilting session was most unusual since the table was moved from inside the Woman’s Tower out onto the gravel of the old exercise yard not once but twice! The séance session we were joined by a spirit called Carmichael aged 52 and he stated he was a Jailer. The room seemed to be very busy with various spirit, but they were not interested in us and various people picked up on this strange phenomena. During the séance however many people were moved, including arm movement but also some people were pushed and swayed. All in all this was a very interesting ghost hunt with activity which hasn’t been experienced before, namely the table tilting, which we hope to repeat on another ghost hunt at the Castle. I often wonder why we don’t come across more criminal spirits at this venue, however I now believe that this is because what we call criminal today is not as bad as it were 200, 300 or even 600 years ago. This Castle has seen many people over the years and that stealing a loaf of bread is looked down upon in today’s society, but 300 years ago it could have meant spending several days in a cell where fights and disease might have killed a person. The first group in the Keep the séance started with lots of arm movements, which quickly evolved into twisting and dragging people towards the cells and sometimes the movement would drag a person to the floor, but generally the movement was always towards one particular cell. Once in this cell Amber felt arms around her neck which freaked her out. However once we came out of the cell the atmosphere for the room had changed, before it was this maleficent sensation, now it was a calm feeling. So I asked each guest in turn to stand by the front window to see what happens. Each guest reported that they felt pushed or pulled (depending on which way they were facing) into the wall. Why this should happen we have no idea, but it happens most of the time to the majority of people. The second group had a more placid time although there were different spirit around; Gordon a gentleman and Percy, a guard I think I have come across before here. Both who tried to manipulate the guests which did result in some arm movement but nothing like the distinctive movements of the first group. We used K2 meters,Ghost Pros, SB7 Spirit Box, EM Pump, REM Pod, Mel Meter, 360 Parascope, Ovilus lll and Tarquin the Interactive Bear. We handed out K2s and Ghost Pros to the guests as we normally do, having activity on the ghost pros almost immediately with some small spikes on both of the K2s. Shortly after the activity started we realised that all of the ghost pros were acting in a way that none of us had seen before, they were all flashing the same pattern as each other but it was a constant random pattern with simultaneous needle spikes, this carried on in short bursts throughout the session. Steve pointed out that we were not alone as he could see a spirit in the corner of the room who had been drinking heavily and staggered around at the back of the room. We placed a 360 Parascope in this area which immediately picked up some static and lit from one side to the other as if someone had “brushed” past it exactly where Steve had seen the spirit. Paula and two of the guests experienced cold spots on them feeling cold on the back of their legs and arms whilst I also felt a temperature drop and static energy around me as I was kneeling to “pray” in front of the cross. Tarquin also mentioned a few times about a temperature change. Steve and one of the guests heard a high pitched squeal come from the area in front of the cross just before I knelt in front of it. It was also noted that the batteries in our equipment were being drained more so than at other locations. Same activity as before with the ghost pros but not quite as badly affected. We managed to get a few answers through the ghost pros but not enough to gather a story on any one of the spirits that were trying to communicate. Soon after we started we all heard noises from the top of the stairwell as if someone was walking around, firstly hearing creaking then footsteps then tapping and finally something that sounded like a coin being dropped on the floor. We decided to try the Ovilus lll to see if any relevant words would come through this device but again as in session 1 it was being affected by this area and refused to work properly, incidentally we tested all of the affected devices and they all worked as they should once we had left the area. During free time whilst in the entrance/shop area we were speaking to the resident guide about John Breads who had killed a man in the churchyard opposite the castle. He pointed to one corner of the tower and told us that this was where John Breads spent the last 60 days of his life so I immediately went to this area with the Ovilus lll device. The first 2 words that sounded from the Ovilus were “Centre” and “Stabbed”. Given that this event was our first at Rye Castle for 2015, we were very keen to see if it were comparable with previous visits. If anything it is more active now than it used to be but now the improvements and building work have finished for the time being and maybe the spirits are happy with that. As with all our events I like to vary the types of things we do in each group, so this time around we had three sessions for the guests to participate in, one with me holding séances, one with Wayne & Paula holding a tech session and another Kym in the Woman’s Tower. Upstairs of the Keep I held the séances sessions and we were joined by Godfrey, a 56 year old portly gentleman wearing a three piece suit who repeatedly jingled the money in his pockets to inform people that he was rich. Godfrey was from the 1830s. There was also another male spirit called Freddie who appeared from time to time. Freddy was a more modern spirit as he was dressed in a more modern fashion of just an open necked shirt and plain/grey trousers, aged in his early 20s. Many of the guests in the first group felt their arms and hands being moved by the spirits and being pushed and pulled to the floor and the circle being pulled and twisted towards the cell that has the graffiti. I moved the least as people seemed to move around me, with those opposite me being moved more often. During this session we all heard what we thought was the main door to the keep being closed or slammed. Considering the outside gate was locked and the other group were in the lower ground floor of the keep it was a bit unnerving, so Ted (Rye Museum custodian) went to investigate. He found nothing out of place or unusual. Many guests saw a face on the headless mannequin or thought they saw a face at the window, this wasn’t a person as we were on the first floor and about 20 feet above ground level! Also whilst standing in a particular spot near the window many guests felt the unfathomable experience of being “sucked” into the wall. Odd lights and strange noises were heard as the session continued, but none of these had any obvious or explainable answer at the time. We will have to see if they happen at future events at Rye Castle. The second group didn’t get anything like the activity of the first group because either they didn’t encourage the spirit to do anything or just took the mickey out of the spirit. Godfrey was present but became disinterested and left. After 40 minutes I ended this session as it was pointless continuing. After we finished our controlled sessions the guests were allowed to investigate on their own and use our ghost hunting equipment. Many went back to the Women’s Tower or sat quietly in the keep to see if spirit would interact with them. Some interesting photos were taken by guests and some felt spirits presence. Once again another interesting ghost hunt with lots of guests feeling and sensing spiritual and paranormal activity. Group B – This was my first visit to Rye Castle this year, so was looking forward to the investigation. Whilst setting up earlier I had noticed the Ghost Pro was doing a lot of random flashing so decided not to use any electronic equipment. We started with the pendulums & rods, and all had some movement. One person didn’t and seeing his frustration, I asked him to control my pendulum, so whilst I was holding it he would ask in his head for spirit to move the pendulum in a particular way, and each time my pendulum moved to his request. This surprised him. We were asking the spirit questions, and we were receiving the same information: male, British, died here in his 50’s, possibly 8 or 10 spirits with us. Ted (curator) was feeling his pendulum being pulled from his fingers. He felt he had the female spirit of Dorothy with him, but she wouldn’t come closer because the Jailor was present. One guest, whilst holding the rods, asked for them to rotate continuous, and was surprised when they both did it instantly. We tried the writing planchette but no movement. We tried the glass, but only little movement. We then tried table tipping, and the table lifted up slowly one side, but just stayed there until it fell over. We tried again and it did the same. Tash (guest) had started feeling pins & needles in her hand, and when she started feeling stabbing pains, looked down to see her hand had swollen a lot. The pain then started moving up her arm. We moved the guests around the table, but Tash’s hand remained swollen and painful. However, Ted was now in the corner where Tash had been, and he was being pulled backwards off the table, until he was in the corner. Ted decided he should step outside, and with only a little more movement on the table, we tried the writing planchette again, but without the paper and pen. The planchette started moving around the table slowly, then the planchette started lifting up and down on one corner. Then it moved to the edge of the table and started moving around the table edge. Group A – Started with the rods & pendulums, most receiving movement, and we had between 20 – 25 spirits with us! Adam (guest) whatever he tried would get no movement. This seemed to be a pattern all night, as if he was being protected. We started with some table tipping, and had some movement. We tried glass work which worked better. Adam, Ryan & Ted were feeling very cold on the backs of their lower legs. We also heard a noise from outside, the same time as Olly (guest) saw a shadow come into the room. The spirit on the glass was female, aged 33, passed in the 1450’s, and was just passing through. However she also said she was connected to Adam, and was protecting him. Adam then asked some personal questions and was very surprised by the answers ie. asking spirit to draw with the glass the dates he was born, house number, and other significant information. We had now started with the free session and guests went off to do their own investigation with equipment. I returned to the Women’s Tower, and my last group were back there talking to the same spirit using the glass. We did switch to the writing planchette and surprisingly we received a lot of drawings, including initials R G for the spirit, go, no, yes, and then Adams name and a heart. 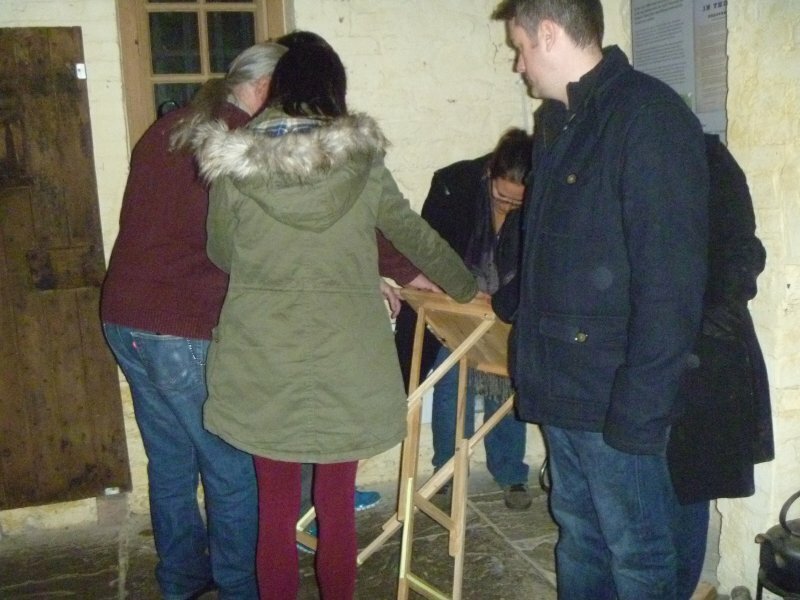 We then went to the basement of the Castle, which had been used as a mortuary, and tried some table tipping. With only 15 minutes left we asked spirit to step forward quickly, to which he did. However with table lifting one way for yes, and opposite for no, it seemed spirit did not want Adam on the table. With just Ryan and friend, the table started lifting and spinning to everyone’s amazement. A great end to the night – looking forward to next time !